Stumptown is a creator-centered comic convention in Portland, Oregon. The convention puts the focus on the people working in their own worlds, as opposed to back issue dealers and the work-for-hire worlds of DC and Marvel that tend to get the lion’s share at they typical comic con. As a result, the Stumptown Comics Fest is high on indie and small press comics. Which is simply wunderbar. Oh, Portland, why must geography conspire to make you so far from SoCal? ‘Course, San Diego’s new Comic Fest is working on heading in that same direction. 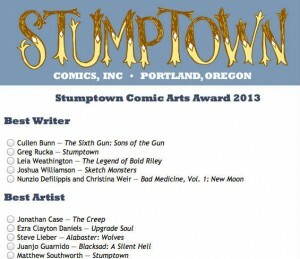 Anyway, I’ve gone aside of the point, which is that voting is now live for Stumptown’s 2013 Comic Arts Awards. You can go over to the Voting Page and cast yours. It’s pretty tough picking, though. I haven’t made it past the “Best Writer” section; I’m torn between Cullen Bunn for The Sixth Gun: Sons of the Gun and Greg Rukka for Stumptown. Gonna have to re-read both when I get home. Oh, what torments I endure. The 2013 Stumptown Comics Fest is scheduled for April 27-28 and will be held at the Oregon Convention Center in Portland, Oregon. Registration is currently open.